One of the greatest things about residential architecture is the big impact even small projects can have on a home and its owners. Take, for instance, this recently completed design. The owners of a 100-year old Washington, DC row house were in dire need of a functional breakfast nook. With two growing boys soon to be 6′-0″ or taller, the current breakfast space was beginning to feel cramped. Though they would have loved to expand the room, as is often the case in row houses, there just wasn’t the space to do so. After exploring a number of design scenarios, it became clear that the problem wasn’t necessarily the space, it was the furnishings. 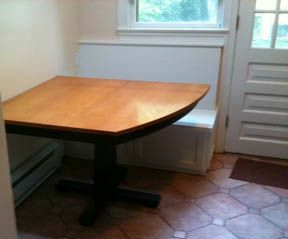 The standard sizes and shapes of available tables just weren’t well suited for the nook. So together, we set out to design and build a custom table. Breaking from convention, the uniquely shaped table provides ample seating for 4, expanding to seat 6 when needed. The soft curve at one end responds to the natural circulation paths in and around the nook. Thoughtful design makes a difference. Every successful remodeling project begins with a quality design. Architects are the only professionals with the education, training, and experience to guide you through the complexities of home renovation. At Pagenstecher GROUP, our architectural staff works with you to develop a unique vision for your home; listening to, and interpreting our needs. They challenge preconceptions and inspire you to consider things you may have never dreamed possible. The result is a home tailored specifically to you.